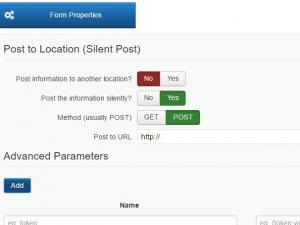 Post to location (silent post) feature allows you to process the collected data via a custom action. 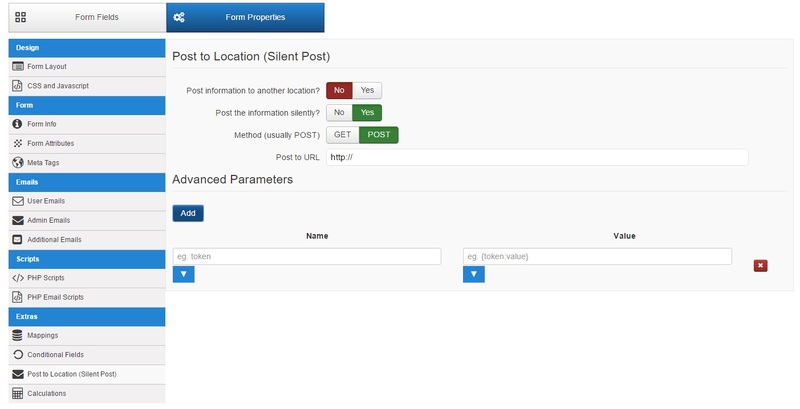 The Silent post feature can be accessed here: Components > RSform!Pro > Manage forms > edit a form > Properties > Post to location (Silent post). Post the information silently: if enabled the submitted information will be posted using cURL and nothing will be displayed to the user (useful for actions that need to happen in the background, for example adding a user to a mailing list). If you want display the URL you are posting the data to at your current location (eg. the page you are posting requires interaction from the user such as filling in additional fields) set this to No. Click on the Add button in order to enable the Name field and Value field of your advanced parameters. When using the Advanced parameters section, only the parameters you specify will be sent and not the whole form data as it's usually sent. This is useful if you selectively want to send certain information and also give the desired parameter names. The actual data processing will take place at the pointed out URL. The usual RSForm!Pro processes will not be affected by this option. Considering that the default syntax used by RSForm!Pro when managing form data is $_POST['form']['fieldname'], it is to be noted that, when using the Silent post feature to post to another location, the syntax used for the POST method will be the standard one: $POST['fieldname'].